With so many products on the market with various ratios of CBD and THC, it can be hard to determine which one will be right for you. This guide is intended to help you figure out which ratio to choose for your particular ailment. Please keep in mind these are suggestions based on feedback from others who have successfully treated conditions with these ratios. You may find your ideal ratio differs from these recommendations. There is currently no set guideline as to how much CBD a person should take for particular conditions. It has been found, however, that taking a regular amount every day consistently has reduced pain and anxiety for many people. In some cases, relief has been experienced with as little as 5-10mg CBD, while others need a higher dose of 30-50mg before feeling relief. While low doses of CBD typically will not produce much of a sedating effect, the higher doses may make some people drowsy. Optimizing one’s therapeutic use of cannabis may entail a careful, step-by-step process, whereby a person starts with small doses, observes the results, and gradually increases the amount as needed. 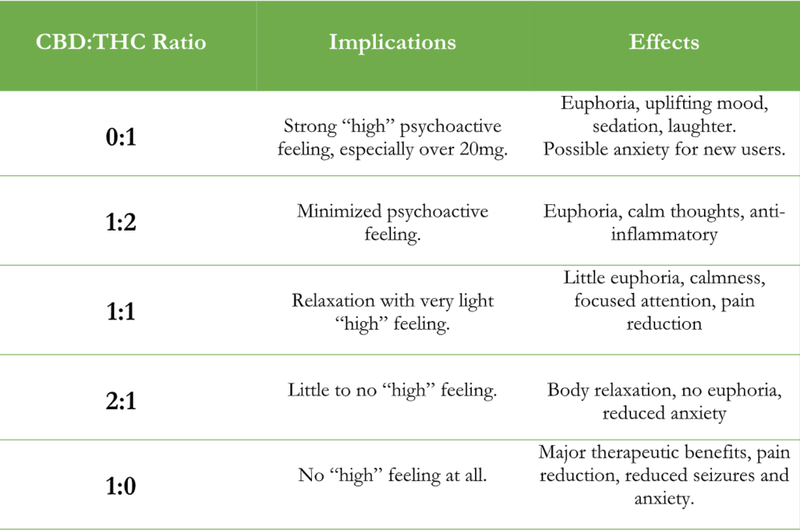 In essence, the goal is to self-administer consistent, measurable doses of a CBD-rich remedy that includes as much THC as a person is comfortable ingesting.